My impression of the debate over international students, which has risen to the boil in recent months, has been of two sides speaking different languages. The universities repeatedly present the same arguments, and the government takes no notice whatsoever. What’s at stake, roughly speaking, is government support for universities in their recruitment of international students. Numbers boomed for a while, and the fees became an important part of many institutional budgets; however, tougher visa regulations and a tightening of post-study work opportunities have led more recently to declines in numbers. While governments of other Western countries are doing all they can to attract international students, the UK government has spent several years sending out contrary signals. The response of universities boils down to two arguments. The first is economic: pages and pages of facts and figues have been produced to demonstrate the importance of international students to regional and national economies. The second is one of definition: that students are not migrants, and therefore should be exempt from the government’s efforts to restrict immigration. Reclassify international students and they can, at a stroke, become good rather than bad. So why aren’t these arguments working? Michael Gove’s infamous trashing of expert opinion might arguably be set aside as part of the prevailing lunacy of the referendum campaign. But it might also be seen as a glimpse into a mind-set that is deeply sceptical of so much of what academics value so highly: evidence, research, reason. This, after all, is a government that tried to ban academics from ‘lobbying’ it on matters of public interest. An IPPR report published last week has demonstrated how flawed evidence has been used to exaggerate the problems posed on the one hand by ‘bogus’ colleges, and on the other hand by students over-staying on student-visas. 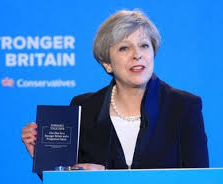 Indeed there are suggestions that senior figures, including the prime minister, may have been overly swayed by dated, impressionistic and anecdotal evidence. Nor has there been much acknowledgement that, to the extent that there was a problem, it may now have been addressed. I note, in passing, that Mrs May’s press release on grammar schools (et al.) last week made just one reference to research: the banal statement, ‘Research shows that prior attainment is one of the biggest factors determining access to university’. Relying on a statement of the obvious as ‘research’ while ignoring the real stuff that stacks up against their policies speaks volumes about this government’s treatment of experts. It doesn’t matter how well we make the case, they’re just not that bothered. It’s deceptively easy to assume that the Tories – traditionally the party of big business – will obviously be swayed by economic logic. Yet, as we’ve learned this year, the Tories are also prepared to sacrifice economic stability and prosperity for the sake of various ill-defined ideals. This government is perfectly – staggeringly – capable of looking at irrefutable economic data, shrugging its collective shoulders and turning away. What we’re told instead is that universities should ‘develop sustainable funding models that are not so dependent on international students’. While the income from international student fees has unquestionably become a major part of university budgets, this position is to apply the economic modelling of cod-fishing to the market for education. There is no effort to demonstrate unsustainability – let alone any acknowledgement that educating students might be kind of a valuable thing to do – just a vague hunch that it’s time to repurpose the fleet. And I sense something more. There’s perhaps a feeling in government circles that universities have dodged austerity – in part because of international students – and that a dose of it would do us good. Hence the symbolic significance attached in many statements to the pay of vice-chancellors, positioned as fat cats riding high on the back of an unsustainable resources boom. Why not teach them a thing or two? Finally – and most importantly of all – I detect a fundamental divergence of views on the role of universities. The argument in favour of recruiting international students positions universities as both key parts of the national economy, and participants within global systems. But we’re dealing with a government that, in one of its first acts, shifted higher education from the Department of Business, Innovation and Skills, to the Department of Education. It’s also a government that – again, on the basis of flimsy evidence – seems determined to believe that universities care too little about the quality of education. So a view that seems to me to have gained traction is that universities need to concentrate more on their roles within the domestic education system and less on their positions within global networks and markets. At the end of a summer in which Britain has turned decisively inwards, this is one almost inevitable manifestation of what the Tories are perceiving as the national mood. In this climate, will Mrs May really lose any sleep over the fact that UK universities are already starting to slide in global rankings? I wouldn’t bet on it. We have to keep making the arguments. We also have to keep demonstrating how education in British universities – for home and international students alike – is changing lives and transforming the world. But, judged by the standards of evidence-based argument that any researcher would accept as essential, this is no ordinary argument. According to a report in The Daily Telegraph, the government is planning a ‘new immigration crackdown on student visas’. This is based on the premise – loopy as it is – that students are migrants. And the Tories remain as committed as ever to reducing migration – even while they merrily jettison many the other planks of their platform. This, it’s worth stressing, is unrelated to Brexit. Indeed many people had hoped that, since Brexit is likely to cause pain in terms of EU students and the precarious state of the Erasmus student-exchange scheme, the government might see the light and finally decouple international students from immigration statistics. That would not only be logical – they’re coming to study, not to stay – it would help just about everybody. Instead we’re told that ‘The Prime Minister has backed calls to restrict student visas so that only the brightest and best can come to study at reputable universities in Britain’. At a time when tens of thousands of international students are graduating, many of whom have worked desperately hard in an alien system just to pass, that’s a lovely little piece of elitism. Their younger siblings have options. I was an international student in this country, spending just over three years in Cambridge, 1988-92. I came here because of the reputation of British universities, the quality of the research resources, and the critical mass of like-minded researchers. The experience wasn’t perfect, by any means, but on the whole it set me up for life. According to The Telegraph, Nick Timothy, Theresa May’s Chief of Staff, ‘believes assessments of the economic impact of foreign students should not overlook the added strain they place on housing and public services.’ Well, Mr Timothy, all I can do is apologize. I went to the doctor three or four times, I cycled on the roads of Cambridge, I drank its limey water. I even – and I’m desperately sorry, but what could I do? – yes, I even shat in its toilets. But I went home again, honest; for my immigration seven years later, I can only apologize again. But Cambridge was paid for the education and resources it provided, and I paid for the BSE-laden beef and ropey East Anglian beer I consumed. Even in my day, international students were clearly contributing a huge amount to the economy of Cambridge. And I contributed, to the best of my antipodean abilities, to the cultural and intellectual life of the university. The people with whom I lived and studied form, today, an impressive global network in terms of success and influence. Today, the benefits of international students in the UK are huge. The UK stands as an academic superpower, with sixteen of our universities ranked in the global top 100. That’s not simply a product of international students, by any means, but it says a lot about the global outlook and ambition of British universities. And there’s nothing natural or preordained about that list, just as there’s nothing natural today about the UK’s status as the world’s fifth biggest economy. These things take an awful lot of work. In economic terms, the value of international students was measured by a Universities UK Report published last month. The benefits, in terms of revenues to universities and expenditure off-campus, are clear. In my own town, our taxi-drivers benefit, my hairdresser benefits; the whole economy of Exeter has been boosted by the growth of international students in recent years. Yes, international students use ‘housing and public services’, but it is absurd to present them as a drain on the country’s resources. Precisely the contrary is true. And it’s not just about the economy, stupid. Universities have grown intellectually as a result of the contributions of international students. They bring expertise and endeavour to research labs, and fresh perspectives to seminar rooms. They stretch and challenge home students. In cultural terms, their influence is also positive, helping to make our campuses more outward-looking, globally-engaged environments. After they graduate, the vast majority of international students return to their homelands, and flourish. They may not all be – with apologies to Mrs May – ‘the best and the brightest’, but they will benefit from their education, maintain the networks they established as students, and remember their formative experiences in the UK. And many will, in due course, move into positions of authority: in business, government, the arts, academia, and so forth. This is ‘soft power’ at work. The UK is undeniably good at soft power; indeed it topped a recent global soft-power league-table, measuring indices across areas of government, culture, education, global engagement, enterprise, and ‘digital’. There’s nothing natural about this list, either, and our reputation will doubtless take a hit post-Brexit, regardless of how well those negotiations are managed. So it seems to me extraordinary that, at the end of a week in which the UK parliament committed to spending about £40 billion on the hardest of redundant hard-power accessories – the Trident nuclear defence capability – we should choose to shoot ourselves in the feet on soft power. In the post-Brexit weeks, the non-British financial centres have been busy courting companies currently based in London. The mayor of Frankfurt described himself as ‘weeping and laughing’ simultaneously. And so it will be, now, in the field of higher education. University leaders in Australia and the Netherlands, among other ambitious globally-engaged countries, will regret the damage the UK threatens to do to itself. They respect us; many of them were educated here. But nor will they waste time attracting the students our government seems so desperate to make feel unwelcome in the UK. So, from one head of department, an apology, for these unfortunate signals from above. In our universities and towns, international students: we value you.